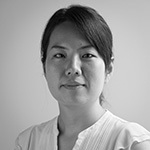 Kiyoko Uematsu worked in the travel industry and at a trading firm for several years since graduating from university. In 2012, she flew to England, and took her master’s degree in Social Development at the University of Sussex. Prior to joining UNU-IAS, she worked as an administrative assistant in the Natural Resource & Ecosystem Services Area at the Institute for Global Environmental Strategies (IGES). She has joined UNU-IAS as part of the ESD team.